We have a strong presence in the West Clubs’ Women’s Hockey League with four ladies’ teams. In addition, one or more of the teams usually take part in the Devon Cup or Devon Trophy knockout competitions; a few friendly fixtures are involved (mostly pre-season) and there is a Ladies’ Summer League and Mixed Summer League to keep players interested outside the main league season. We also offer opportunities for veterans. 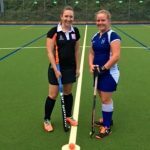 (photo) Ladies 1st XI captain Katie Dean opens the 2017-18 season on our newly laid Astro (Sept 2017).